The performance of the worldwide manufacturing sector remained very weak in February. 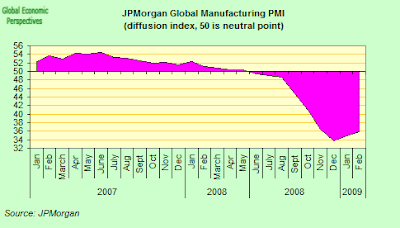 Although the JPMorgan Global Manufacturing PMI rose further from December's record low, at 35.8 it was still well below the critical no-change mark of 50.0. Rates of decline eased for production and new orders, but accelerated to reach a new survey record for employment. Employment declined for the eleventh successive month in February. The performance of the US manufacturing labor market was especially weak, with staffing levels falling at the fastest pace in the sixty-one year ISM series history. Employment also fell at survey record rates in the Eurozone, Japan, the UK, Australia and Switzerland. 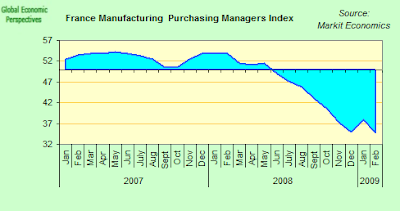 Final Purchasing Managers’ Index data confirms that the rate of deterioration of the Eurozone’s manufacturing economy continued to gather pace in February. The Markit Eurozone Final Manufacturing PMI fell from 34.4 in January to 33.5, the lowest reading in the 11.5-year history of the survey and also slightly below the earlier Flash reading of 33.6. The renewed downturn in the PMI was driven by output falling at a new record rate, and to a greater extent than signaled by the Flash, registering the ninth successive monthly fall in production. Slower rates of decline in Germany, Spain, the Netherlands, Greece and Austria were countered by sharp accelerations in rates of contraction in France and Ireland and a more moderate acceleration in Italy, with all three latter countries seeing record falls in output. Operating conditions remained extremely tough in the German manufacturing sector in February as a near-record downturn in new orders led to another rapid reduction in output. Lower workloads and subsequent excess capacity led to further staff restructuring in February, with data pointing to the fastest rate of job shedding since the series began in April 1996. Meanwhile, the deflationary dynamic in factory gate prices strengthened in February, with charges reduced sharply in response to low demand and a marked fall in raw material costs. 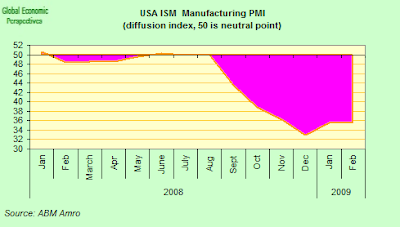 The headline seasonally adjusted Markit/BME Purchasing Managers’ Index (PMI) – designed to give a single-figure snapshot of operating conditions in the manufacturing economy – posted 32.1 in February, little-changed from the earlier ‘flash’ figure of 32.2. 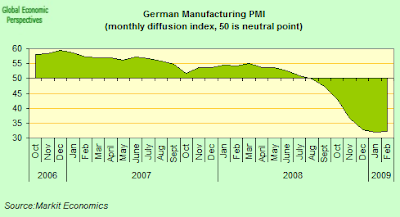 Although the PMI remained indicative of a sharp retrenchment of the German manufacturing sector, the index rose for the first time since March 2008. The slight rise in the PMI, from 32.0 to 32.1, was largely the result of a slower contraction of production levels compared to January’s survey record. New order volumes continued to fall at a near survey record rate in February, reflecting a general reluctance among clients to commit to new work. Anecdotal evidence also pointed to shrinking demand from companies in the automobile sector. Input prices fell rapidly in February and the rate of deflation was little-changed from the previous month’s survey record. Meanwhile, data pointed to a fourth successive drop in factory gate prices, with the rate of deflation the fastest since the series began in September 2002. 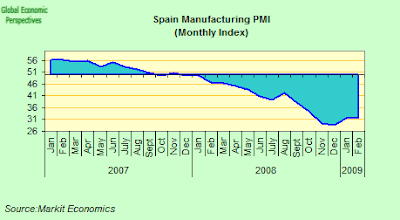 Spanish manufacturing conditions continued to deteriorate in February at levels similar to a month earlier, though off December's record low. The indicator rose in February to 31.8 from 31.5 a month earlier, both readings significantly off December's record low of 28.5. "Although the headline PMI ticked up again in February, operating conditions remained extremely tough. 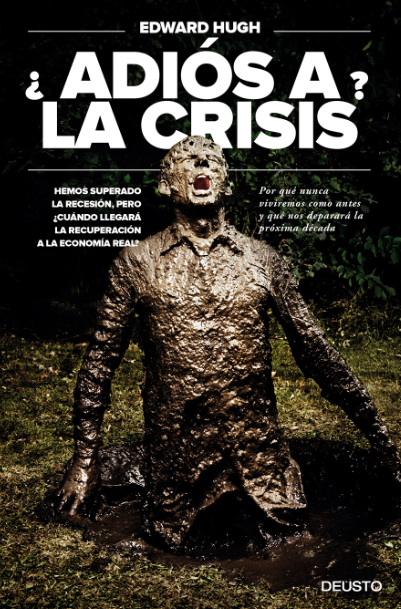 It is still too early to start talking of a recovery in the Spanish manufacturing sector," said Markit economist Andrew Harker. Over half of those surveyed reported lower orders in February due to falling demand and noted particularly sharp declines in demand from abroad, especially Europe. Both output and input prices slipped to record lows as the economic environment deteriorated, with raw material prices easing and producers cutting prices to stimulate demand. "The series record falls in both input prices and output charges signal that deflationary pressures are set to intensify, with consumer price deflation possible in the near future," said Harker. Italian manufacturers faced another month of deteriorating operating conditions during February. Output, employment and outstanding business all fell at series record rates, while new business from both domestic and foreign markets fell sharply. The headline seasonally adjusted Markit/ADACI Purchasing Managers’ Index posted 35.0 in February, down from 36.1 in January and a reading only marginally above November’s survey low. New business received by Italian manufacturers fell for the 14th straight month during February, and at an accelerated rate from January. The far-reaching impact of the economic downturn was cited by respondents as the principal factor underlying the latest decline. The drop in demand was broad-based with falls in new orders reported in both domestic and overseas markets. Employment at Italian manufacturers fell at the fastest pace on record during February. Panel members reported that plummeting workloads had been the primary force lowering staffing levels during the month. Deflation remained evident in the sector during February as both input and output prices fell at series record rates. A sharp drop in raw material prices was cited as the key factor driving down costs. The fall in input prices partially accounted for the record decline in factory gate charges. The economic downturn increasing competitive pressures was cited as a further key factor forcing manufacturers to lower tariffs. More generally, panelists reported that liquidity constraints had forced them to request longer crediting periods, thereby impacting on their ability to make new purchases with vendors. Combined with reduced production requirements, Italian manufacturers subsequently lowered their purchasing activity and (where possible) utilized existing stocks of purchases. French manufacturing activity contracted at a record pace in February as new orders remained weak.The weakness in the sector's activity level was reflected in the manufacturing purchasing managers index, which fell to an all-time low of 34.8 in February, down from both the 35.4 figure expected and January's 37.9 figure. According to Markit, the reduction in output was due to ongoing declines in new orders levels, with data suggesting both domestic and foreign markets are deteriorating. "Another steep drop in new orders suggests that extremely weak demand is becoming entrenched, with firms remain focused on reducing their inventories of both purchases and finished goods," Markit economist Jack Kennedy said in a press release. Furthermore, with the PMI pointing to record low levels in both input and output price components, deflationary pressures are likely to grow, adding to arguments for further monetary easing in the euro zone, Kennedy added. Japan's February manufacting PMI showed manufacturing activity contracted for a 12th straight month in February, underscoring the fact that the depressed state of Japanese industry is likely to continue. 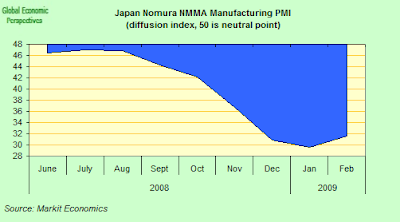 The Nomura/JMMA Japan PMI edged up to a seasonally adjusted 31.6 from a record low of 29.6 in January. China’s manufacturing shrank for a seventh month in February as the global financial crisis cut exports and growth across Asia. 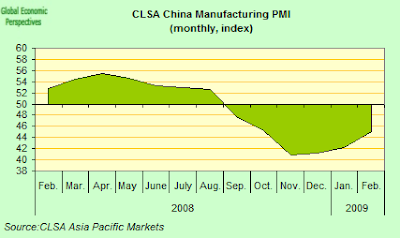 The CLSA China Purchasing Managers’ Index rose to a seasonally adjusted 45.1 from 42.2 in January. The index for export orders rose to 39.5 in February from 36.3 in January. A measure of orders climbed to 44.2 from 39.9. Output gained to 43.9 from 39.7. An employment index rose to 46.6 from 45, its first increase in seven months. Indian manufacturing activity shrank for a fourth straight month in February as the global downturn hurt demand and soured business sentiment, a survey showed on Monday. 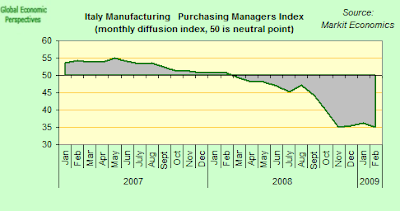 The ABN AMRO Bank purchasing managers'index rose to a seasonally adjusted 47.0 in February from January's 46.7. The Indian economy grew 5.3 percent in the fourth quarter of 2008 (calendar), according to Indian government data released last Friday, below forecasts of 6.2 percent and the previous quarter's growth of 7.6 percent. Russian manufacturing contracted for a fifth month in a row in February as the ruble’s devaluation increased corporate costs and demand slumped at home and abroad, according to the latest report from VTB Capital. 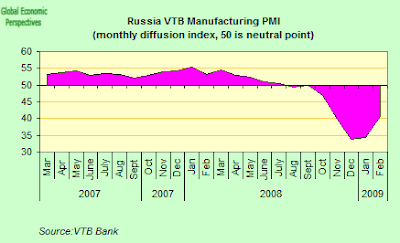 VTB’s Purchasing Managers’ Index was at 40.6, after a 34.4 reading in January. The duration of the index contraction now matches the decline registered in 1998, when the government dropped its support of the ruble and defaulted on $40 billion of debt. And the contraction doesn't seem set to end anytime soon. economist at VTB Capital in Moscow, said in the report. 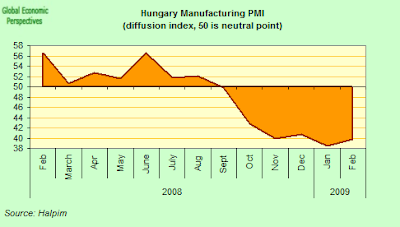 Hungary's manufacturing purchasing manager index came back slightly from its all-time low of 38.5 in January to 39.7 in February, according to the Hungarian Association of Logistics, Purchasing and Inventory Management (HALPIM), the publisher of the PMI. While the contraction of the manufacturing industry that started last October continues, the rate of contraction has eased slightly. 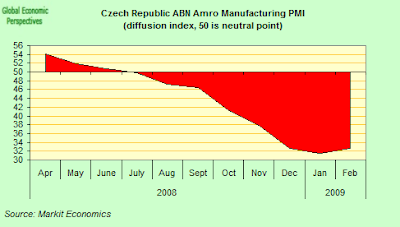 The Czech Purchasing Managers' Index (PMI) rose to 32.6 in February, from 31.5 in January, the first upward move in a year, but the reading still indicated a rapid contraction, according to the press release from Markit Economics and ABN Amro. The figure for output continued to fall at a sharp rate overall in February for the eighty month. However, seasonally adjusted output rose for the second month running from December's record low, indicating the weakest rate of decline in three months. New orders remained well below the no-change mark of 50.0 in February, indicating a seventh successive monthly drop. For the third month running, over half of the survey panel reported lower new orders, linked to the worsening climate of demand both at home and in key export markets. 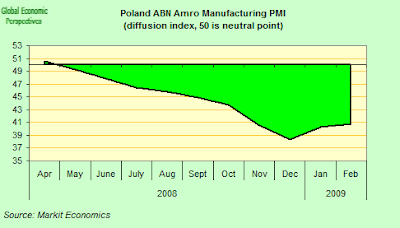 The Purchasing Managers' Index for the Polish manufacturing sector rose in February for the second month in a row and came in at 40.8 (from 40.3 in January). However, the figure for output fell to 40.2 points from a previous 40.6 points. Analysts said the February PMI figure probably marked a rebound after earlier sharp declines and suggested a weaker zloty may have helped cushion perceptions of the downturn by making exports cheaper. But they added that the outlook for growth remained grim. Manufacturing contracted in February as the PMI registered 35.8 percent, which is 0.2 percentage point higher than the 35.6 percent reported in January. This is the 13th consecutive month of contraction in the manufacturing sector. A reading above 50 percent indicates that the manufacturing economy is generally expanding; below 50 percent indicates that it is generally contracting. A PMI in excess of 41.2 percent, over a period of time, generally indicates an expansion of the overall economy. 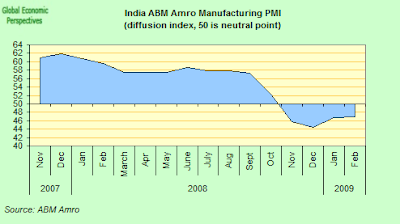 Therefore, the PMI indicates contraction in both the overall economy and the manufacturing sector. Ore stated, "The past relationship between the PMI and the overall economy indicates that the PMI for February (35.8 percent) corresponds to a 1.7 percent decline in real gross domestic product (GDP) on an annual basis."